S.T. Dupont pays homage to Samurai warriors with this exceptional Limited Edition fountain pen modeled after the Samurai weapons and armour. 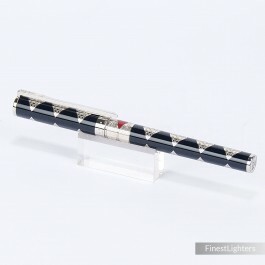 The body of the pen is engraved with a fine texture, and is decorated with midnight blue and red Chinese lacquer with palladium (platinum) accents. Medium size 18k white gold nib. For more information about "Samurai" Limited Edition click here.S.T.Dupont Samurai Limited Edition large fountain pen recalls the look of the Samurai weapons.